Cartographically speaking, we’ve lost our bearings for quite some time. Long before the invention of postmodernism there were already multidisciplinary scholars who, standing at the cradle of computing science, argued that the map should not be confused with the territory it represents; in other words, that a name is not the same thing as that which is named. It was an insight that dealt a hard blow to traditional cartographers, for does not traditional cartography exist by the grace of an inalienable connection between information (data) and visual representation (the map)? The information used to make the map consists of empirical, visible and verifiable quantities. The map is a means of orientation in physical reality, on the basis of a recognizable code chosen by the map-makers to represent this reality. Once understood, the code can be used to open up any territory. The map is therefore a sort of mirror of nature, which tries to question the relationship between reality and map as little as possible. The bottom has fallen out of this relative uncomplicatedness as a result of the increasing mediatization and democratization of digital (communication) technologies. Notions such as scale, distance, vicinity and space are now being defined completely differently. The effect of media and technology is simply to re-evaluate our awareness of the essence of space and time. In addition we had postmodernism pointing to the crisis of legitimization that had arisen in philosophy and science as a result of the loss of all ‘grand narratives’ that were able to interpret and unambiguously explain the relation between thinking about the world and the world as a physical phenomenon. As a cultural movement, postmodernism symbolized a growing disbelief in objective legitimacy. It was a thinking that brushed absolute statements aside with an ironic gesture. Every assumable position from which the world could be viewed was considered equally ‘true’ or ‘valid’. This neo-liberal principle of ‘anything goes’ opened the door to disorientation and eclecticism. The gospel of postmodernism demanded that ‘goal’ and ‘destination’ – in terms of both space and time – should be quickly erased from our consciousness. Such notions, after all, thoroughly stood in the way of the free market, freedom of movement and aimless experimentation. The popular credos of traditional science, such as ‘to measure is to know’, were dismissed by the ‘pomos’ as hilarious misunderstandings. The world became a theatre of simulacra; a make-believe world consisting of mediatized effects. The ‘objective’ world that modernism attempted to perfect turned out to be something that only existed in one’s head; a product of our imagination. Here we have all the ingredients for a GPS nation physically enjoying the metaphorical principle of ‘anything goes’, but now with free phone minutes and credit at the bank. We are mobile, we have a mobile phone and a credit card and can thus go anywhere we want. The world is completely opened up, both as an information space and as physical space. Even though we might not have a developed sense of direction at our disposal and our knowledge of topography is extremely rudimentary, there is nothing wrong as long as we keep moving and communicating. Trusting all our technological appliances like TomToms, mobile telephones and the like, we eventually get home safely, as though we’d never been away. And in moving from place to place, what counts is that all these technological interfaces and medial interventions allow us to experience the journey as comfortably virtual. 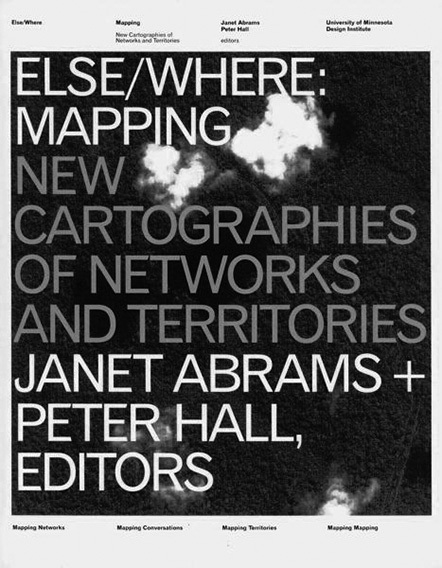 The starting point of the recently published book Else / Where: Mapping by Abrams and Hall is the idea that ‘mapping’ is a necessary means of not getting lost in the dense information landscape in which we exist on a daily level. The authors see mapping as a sort of conceptual glue that temporarily examines and clarifies connections between the tangible world of buildings, cities and landscapes and the intangible world of social networks and electronic communities. An artistic glue that, in the eyes of Abrams and Hall, needs to be manufactured and applied not by traditional cartographers but by enlightened designers. This is utterly in the style of the approved postmodernist thinking: even though this grand project might not completely succeed, traditional cartography should be wiped off the map! The mapping that Abrams and Hall are advocating is not a question of producing perfect maps that once and for all definitively indicate relationships, connections and ratios based on a standardized perspective, but the unfinished process of mapping itself. They see mapping as a new cultural language that invites people to offer their own temporary, visual solutions and orientations regarding the daily stream of disoriented information. This type of ‘mapping’ thus shifts attention from the complete representation of the traditional map to an understanding of the differences between database, interface and user. Mapping, in this sense, enables different representations to be created from the same data, each of which in turn emphasizes different ways of seeing, interpretations and usage. Comparable with the thrust of the postmodernist Roland Barthes’ famous essay announcing ‘the death of the author’, the responsibility no longer simply lies with the maker of the map, but just as much with the user. The term launched by Abrams and Hall in this connection is that of ‘user cartographer’. The space that the ‘user cartographer’ maps can vary from information space (understanding patterns in large amounts of data) to physical space (navigating in cities, regions or across the globe) and social space (representing power structures within and between organizations). In particular, it is the conceptual overlapping between these different ‘spatial’ domains that designers could turn into a new workable synthesis. For the fact is, Abrams and Hall see this critical mapping as a key creative quality and activity of designers, whom they regard as cultural agents in possession of the multidisciplinary qualities needed to function as information guides (‘editorial designers’) by providing new ways of making complex, context-rich information visible and interpretable. Published by the University of Minnesota Design Institute (where both Abrams and Hall teach), this book refers to a wide range of graphic and industrial design projects, art, architecture and technology; a cross-section of what is happening in the area of this new cartography. Like other forms of information design, mapping is thus released from any claim to objectivity. But the question raised by the book is what the character is of the collection of projects that Abrams and Hall are offering on the basis of their postmodern insights. On closer examination they seem to be mainly projects that come very close to art and are fairly removed from the ways that the public at large deal with information on a daily basis. In this sense the book’s pretensions are not really substantiated. Projects like Mark Hansen’s Listening Post – presented by the editors in their ‘Mapping conversations’ section and winner of the Golden Nica at the 2004 Ars Electronica Festival in Linz – is a three-dimensional installation of a sea of led screens generating texts from Internet chat rooms, combined with a soundtrack composed by Hansen. Using a specially written programme, Hansen makes the raw material from the chats pass before our eyes in various forms. But however much science may be required for this intervention, the final result mainly evokes a reverie and emotion that is more related to art. The work does not help insight to be gained on a practical level into the complex dynamics of Internet chats. And this limitation applies to the majority of the projects dealt with. The practical utility of the experiments and new (mostly digital and cartographic) technologies proves on closer examination to be slight or even absent. The many critical essays that could have been used for putting this artistic research into a social context also tend not to seek out a confrontation with the daily practice of navigation and working with new metaphors for the graphic and interactive representation of physical space and ‘info-space’. If one of the book’s pretensions is to want to be helpful in relation to the major social issue of guaranteeing free access to available information, then the editors could also have selected projects that don’t hide behind the context of research and / or art for a change. For is it not the case that, in the daily confrontation with information begging to be ‘processed’, we are not only amply familiar with our postmodern condition, but also and in particular with the profound awareness that – in terms of information and interface design as well – we have already discretely made a mental map of a lot of social differences and instabilities? Despite Abrams and Hall’s informative and enthusiastic contribution, we’re still waiting for a genuinely democratic opening up of these social differences. But in order for this to happen perhaps the oppressive academic postmodern perspective first has to be wiped off the map.